How Do Geoarchaeologists Use Remote Sensing to Interpret Landscapes? Remote sensing detects both human and physical features by using seven distinct image elements: tone, shape, size, pattern, texture, shadow and association. Students are introduced to each of these elements individually through images, descriptions and related questions. Then, by assimilating and applying their knowledge, they interpret the remotely sensed image of an unidentified location. The URL opens to the investigation directory, with links to teacher and student materials, lesson extensions, resources, teaching tips, and assessment strategies. 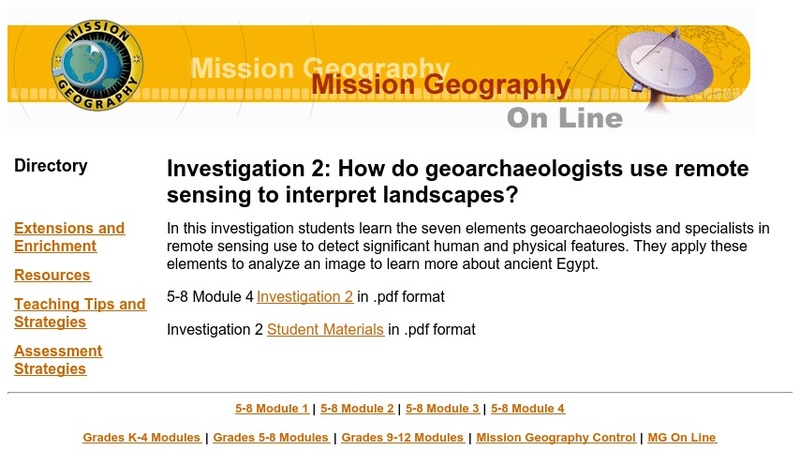 This is Investigation 2 of three found in the Grades 5-8 Module 4 of Mission Geography. The Mission Geography curriculum integrates data and images from NASA missions with the National Geography Standards. Each of the three investigations in Module 4, while related, can be done independently.